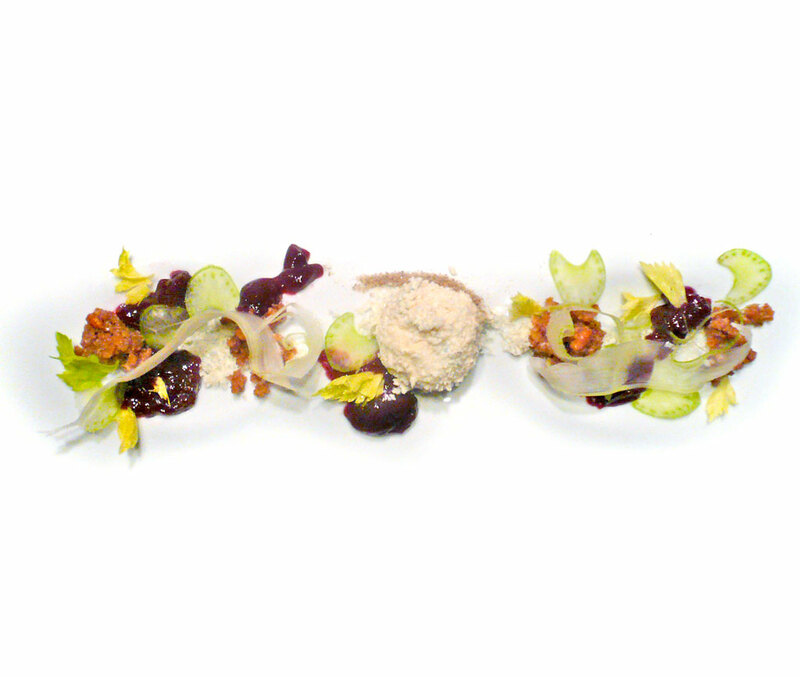 Maytag Blue, Grape, Walnut, Port – Alinea Restaurant cookbook recipe, pages 166-167. 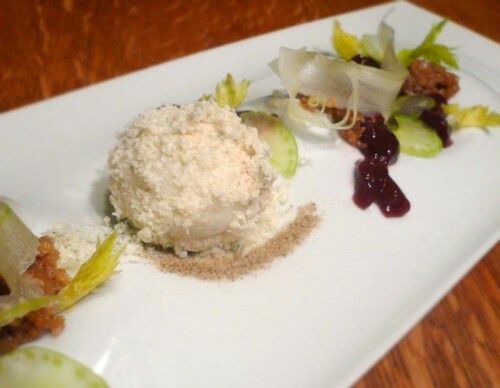 It’s Alinea’s whimsical take on the all-American party favorite: an inside-out cheese ball with nuts, wine and celery! I toasted some walnuts in the oven until they were fragrant and had released their oils. In a medium saucepan, I combined the whole milk, sugar and a touch of salt, and brought to a boil to dissolve the solids. I let this cool a bit then transferred to a bowl with the walnuts, then let them steep, refrigerated, overnight. I juiced the green grapes in my Breville Juicer, then strained into a container. I combined the grape juice, sugar, citric acid and salt to taste in a medium saucepan, and brought to a boil to dissolve the solids. I re-hydrated the gelatin sheets in cold water, and squeezed out the excess. 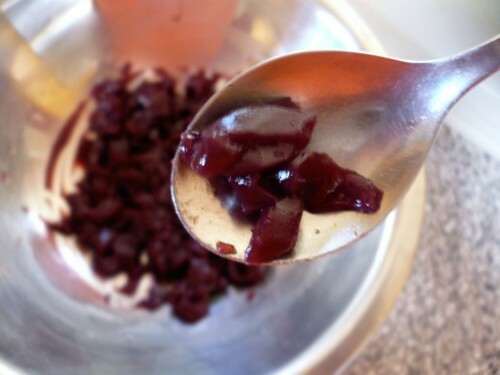 Then I brought some of the grape juice to almost a simmer, and added the gelatin sheets, whisking to dissolve. Then whisked some more, placing my bowl in an icebath to speed up the process. 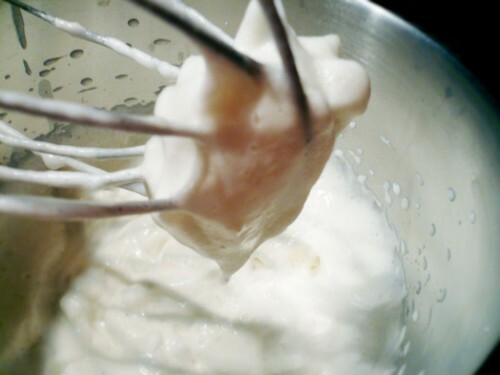 Then whisked the juice on high with my KitchenAid mixer. Enough until it turned white, thickened, and formed stiff peaks. 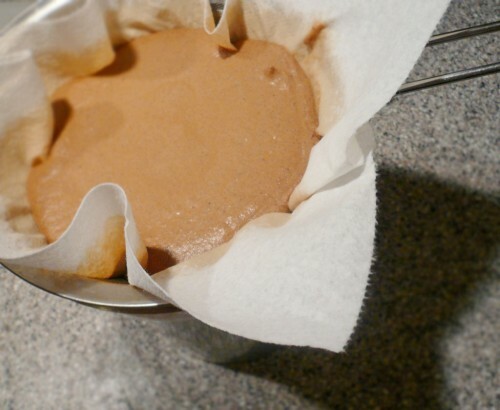 Then I put it into a pastry bag, so I could fill some hemispheric molds…. Speaking of hemispheric molds, I found the perfectly sized one right in front of my nose — the plastic egg basket in my fridge — check it out! 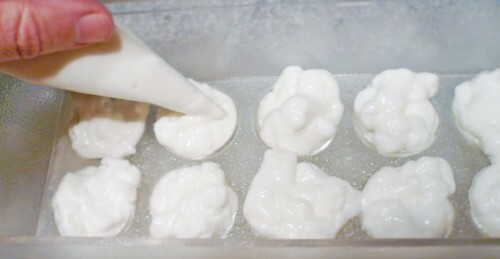 I piped the juice-sponge-foam into the molds (over-filling them so I could later top them off cleanly ) and popped into the freezer. After they’d set up, I heated a metal spatula with a brulée torch and sliced off their tops, flush with the mold. Then used a small Parisienne scoop to hollow out the insides. Now to assemble the spheres. I melted the “equator” edges of one, and pressed another hemisphere to the first, holding for a minute until the edges bonded. You have to make sure there are no gaps. This ball has to hold liquid, so the more complete the seal, the better. 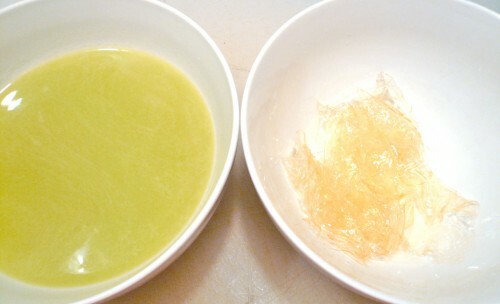 Two ingredients: wine and gelatin. That should be easy. I used a bottle of Sandemann’s Ruby Porto, which I like — you could use any that you prefer. Especially because you’ll only be using a portion of the bottle — and you don’t want to let the rest go bad. So drink it while you cook! I rehydrated the gelatin sheets in cold water and measured out the Port. Next, I reduced the wine in a saucepan. 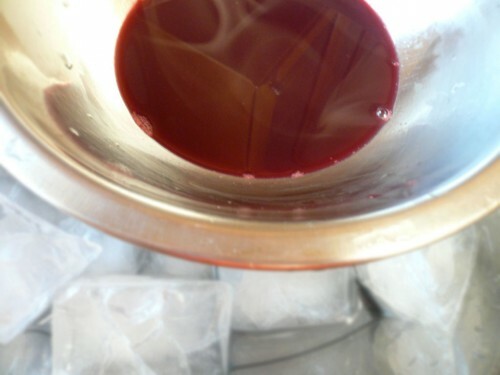 Reducing (evaporating) the wine intensifies the flavors, increases the its natural sweetness and thickens it. I gently tipped the pot to ignite the alcohol, and burned it off. Fun for pyros! Removed it from the heat and whisked in the gelatin. I transferred the port gel mix to a small stainless bowl set over an ice water bath to cool. After It had set up, I used a spoon to loosen it up into rough pieces, then reserved to the fridge. There are two kinds of celery slices in this dish: the regular, and long, shaved strips. For the first, I used a new mandolin to slice the celery as thinly as possible. For the shavings, I used a vegetable peeler and sliced long strips off the stalks. I reserved these in ice water, which curls up the strips (not unlike wood shavings). I also reserved some yellow and green celery leaves in ice water. 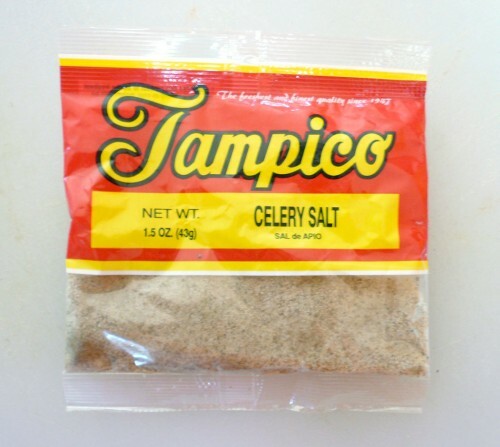 The recipe says to make your own by toasting celery seeds and grinding them up with kosher salt. But I already had a package or ready-made celery salt, so I used it instead. I had previously put a wedge of Maytag Blue cheese in the freezer to harden up so I could grate it into a powder. This component recipe uses an Antigriddle from PolyScience to freeze the grated cheese (US$1235.00, available directly from their website, or US$1,199.00 from JB Prince). 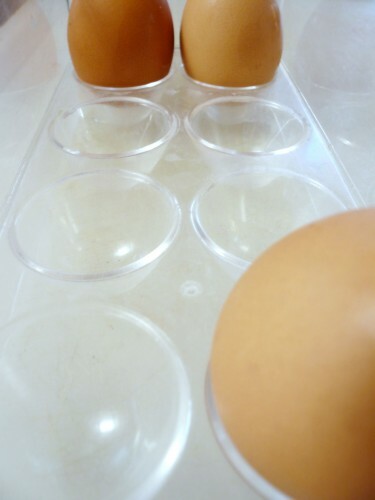 It’s a wonderful product you may have seen on TV, that freezes things put on its super-chilled griddle top. I don’t have one. 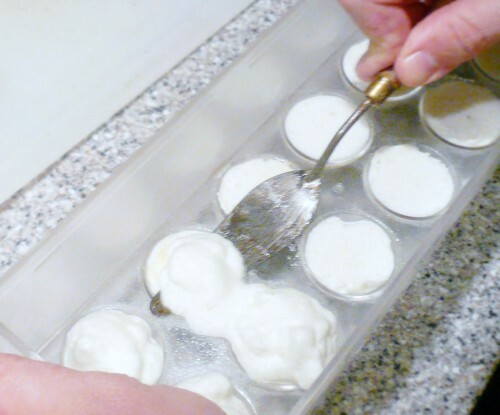 But I MacGyvered a substitute together with a frozen sheet pan placed over a slab of dry ice. I removed the cheese and sheet tray from the freezer, placed the tray on a flat slab of dry ice, and quickly grated the cheese in a fine layer onto the frozen surface. I had to work very quickly, as the heat from my hands melted the cheese as I held it. Then quickly replaced the tray into the freezer. 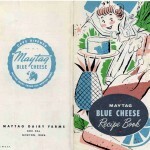 What’s all the fuss about Maytag Blue Cheese? There are many types of soft cheese with ribbons of blueish penicillium mold running through them. But when you talk about cheese, bleu cheese from the Combalou caves of Roquefort-sur-Soulzon, France immediately comes to mind. The word “Roquefort” is a PDO-controlled name, just like “Champagne” — meaning you can’t call your product Roquefort or Champagne unless it really comes from there. The United States has their own blue cheeses, and that from the Maytag Dairy Farms in Newton, Iowa has recently become a frontrunner, due not only to their aggressive marketing efforts, but to its popularity with chefs desiring a home-grown favorite. You’ve probably seen it on a menu in the last couple of years. I took some of the fresh grape juice I had previously made, and brought it to a simmer in a small saucepan. I reduced it until it coated the back of a spoon, then removed from the heat to cool. I used the Alinea ‘Craters’ plate, designed by Crucial Detail, for this dish. No matter what plates you choose, it’s important to chill them before service. 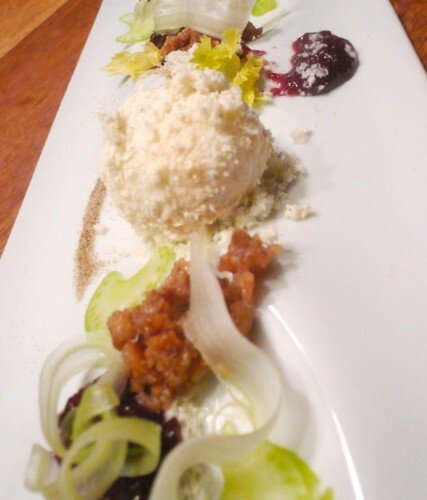 A warm plate will only melt the blue cheese, and we don’t want that. I started with a trail of grated blue cheese long the length of the plate. I spooned some more in the center of the plate, to serve as a foundation for the grape sponge. And added a line of celery salt. 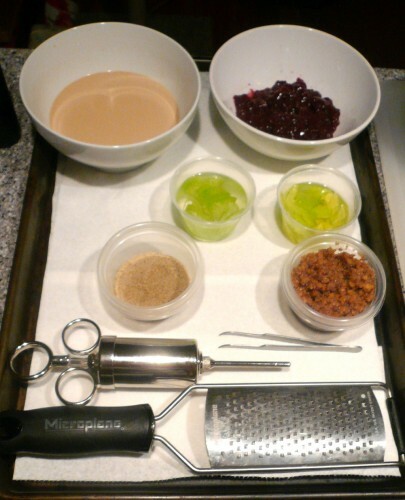 Then I added random dollops of port gelatin and walnut crumbs, followed by celery ribbons, slices and leaves. I tossed the hollow walnut sponges in some walnut oil, took the sheet pan of Maytag Blue out of the freezer, then rolled my balls in grated cheese. Taking a turkey basting syringe, I injected the spheres with the walnut milk. It was a bit hard to judge when to stop, and there was some spillage. But not too bad. I filled the needle marks with blue cheese. 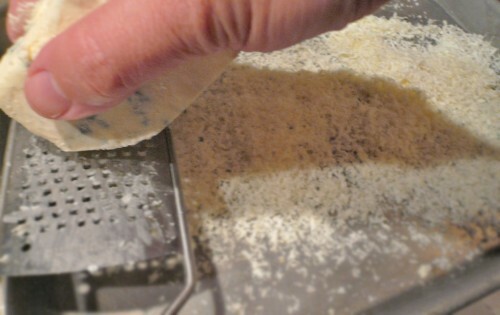 Then put them in the freezer for a few minutes to harden the grated cheese up again. It was a delicious combination that everyone loved. The unexpected pleasure comes in eating the dish. 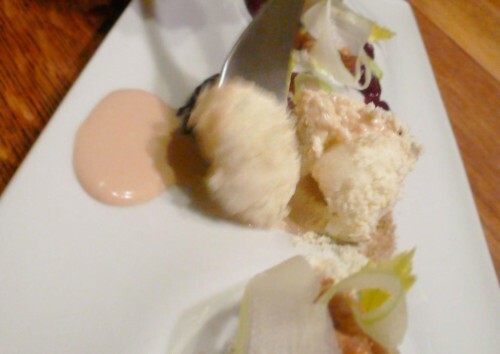 Everyone was surprised when digging into the grape sponge — an explosion of walnut milk squirts out! We didn’t have too much left over this time. The grape sponges didn’t keep very long, but I did not freeze them. The walnut crumbs were good on waffles the next weekend. And the blue cheese? 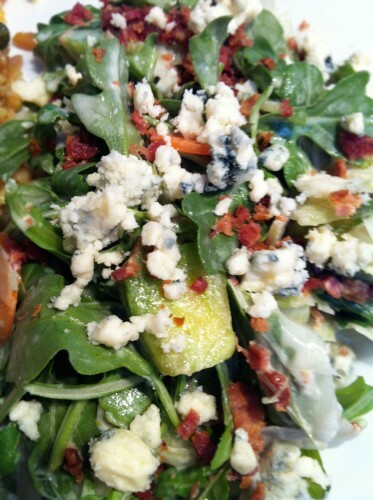 Great in an arugula salad with bacon! I prefer Castello – Another American made Blue. Why are almost all your photos out of focus? Please learn a bit about photography – it would make this site so much better. Thank you so much for that professional advice!